Ares Games has updated their Galaxy Defenders board game Kickstarter in order to create new pledge levels for international backers. They've also updated their stretch goals. With the new pledge levels, Ares Games will take upon itself completely the shipping charges. Starting with 100 Early Birds at US$ 155 - the normal pledge for this level will be $ 170 - it will offer the same rewards of the Elite Agent level (1 copy of the Galaxy Defenders Game, 4 Kickstarter-Exclusive Miniatures, plus Stretch Goals), plus US$ 50 of options, with free shipping worldwide. The new stretch goals posted today offers even more incentives to people interested in supporting the project. At US$ 90,000 pledged, the KS backers will receive, free of charge, the Alien G-Droid, and an optional add-on (again, for KS backers only) will be available - the Human version of this awesome character. At $ 100,000, the murderous Xeno-Beast will enter the scene, as a free bonus. If this goal will be unlocked, one red Xeno-Beast will be added to the core set. 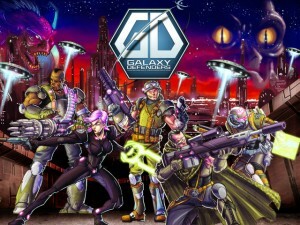 Other stretch goals are defined for US$ 110,000, US$ 120,000 US$ 130,000, and US$ 140,000, including Galaxy Ball, a SF sport/combat game using the Galaxy Defenders miniatures. Besides these value-based stretch goals, new backers-based goal will be announced later.